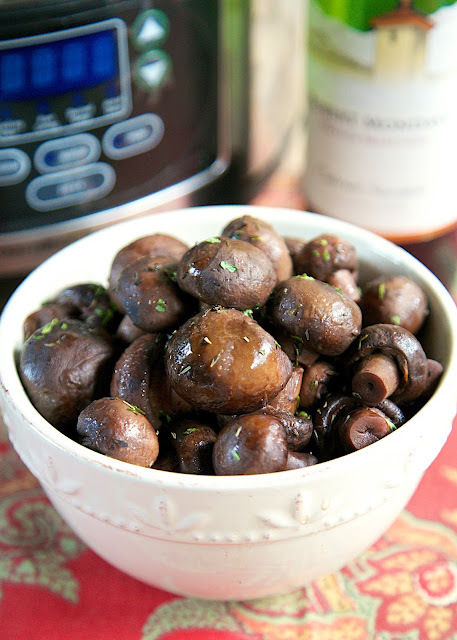 Slow Cooker Burgundy Mushrooms - fresh mushrooms slow cooked with red wine, beef broth and seasonings. Great as a side dish or over a steak. Can freeze leftover juices to flavor soups and vegetables. Chicken Legs absolutely loves mushrooms. I am always looking for new ways to prepare them for him. 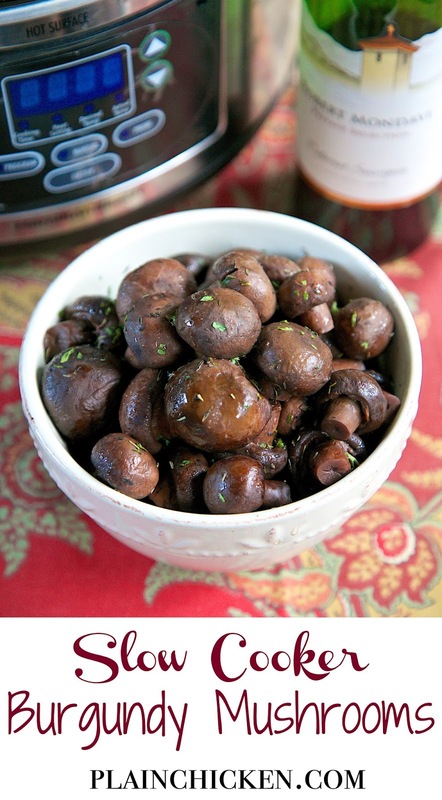 I found this recipe for Burgundy Mushrooms and decided to give them a try. WOW! They were great! 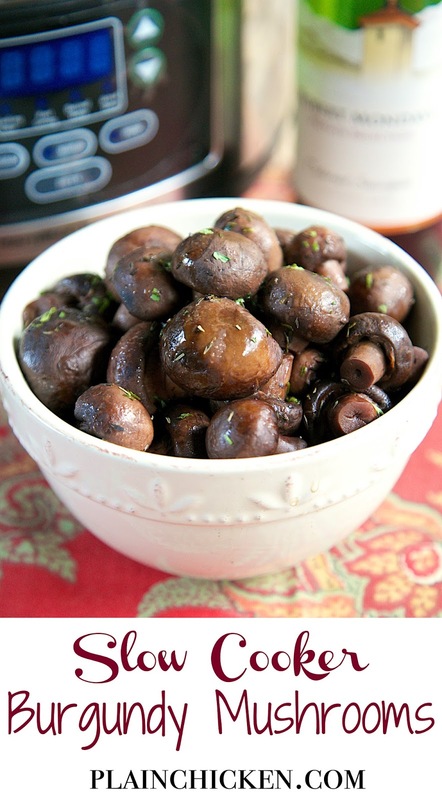 They are a great side dish or even better served over a nice juicy steak! 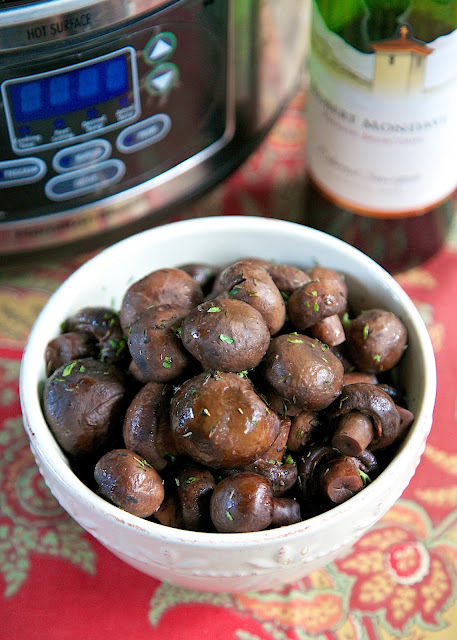 The mushrooms use 1 1/2 cups Burgundy wine. I had a bottle of cabernet sauvignon in the house, so that is what I used. I would suggest using something that you like to drink since you aren't using the whole bottle for the recipe! There is a lot of juice leftover in the slow cooker. You can freeze it in ice cube trays and use it later to add lots of great flavor to soups or veggies. It would also be good with a yummy French Dip sandwich. Place all ingredients in a 6-qt slow cooker. Cover and cook on LOW for 8 hours. They sound very good to me. Mushrooms are one of my favorite things! One of my pet peeves: when I invite someone over to my house for a meal and cook something with mushrooms in it...and they pick them all out. It's happened multiple times! I've resolved to never cook mushrooms for guests again. Luckily my husband loves them! Also...thank you so much for your words of wisdom at SFBR this weekend!! !